Deployment of API proxy revisions via the Edge UI or Edge management API call fail with the error "Error while accessing datastore". Error in deployment for environment qa. Undeploy and redeploy the API proxy. If there was a temporary connectivity issue between the Message Processor and Cassandra, then the error might go away. WARNING: Don't undeploy if the errors are seen in the Production environment. Repeat step #2 to see if the deployment succeeds on the Message Processor that was restarted. If no errors found, then that indicates the issue is resolved. If you get the response "Connection Refused" or "Connection timed out", then engage your network operations team. If the problem persists, then engage your network operations team. Work with your network operations team and get the network connectivity issue fixed between Message Processor and Cassandra. Cassandra nodes are usually restarted periodically as part of routine maintenance. If API proxies are deployed during the Cassandra maintenance work, then the deployments fail due to inaccessibility to the Cassandra datastore. Ensure Cassandra is up and running. Check if Message Processors are able to connect to Cassandra datastore on port 9042 and 9160. A high number of reads on Cassandra is dependant on individual use cases and traffic patterns on the proxies that contain policies that require read access from Cassandra. For example, if a GET call to refresh_token grant type is called for OAuth policies, and the refresh token is associated with many access tokens, then this may result in high amounts of reads from Cassandra. 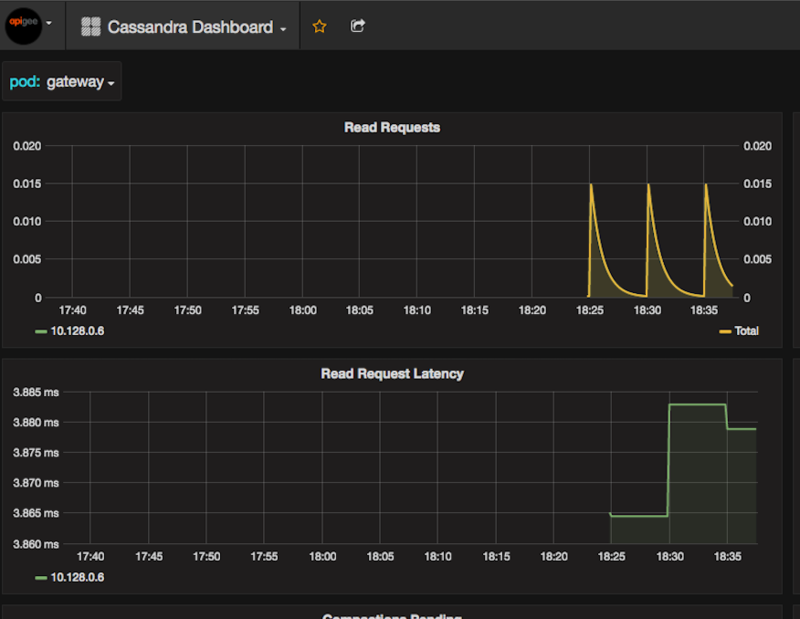 This can cause increase in the read request latency on Cassandra. If you have installed the Beta Monitoring dashboard, look at the Cassandra dashboard, and review the "Read Requests" chart for the period of the problem. Also review the chart for "Read Request Latencies". Alternate tool to check the read requests and read latencies is the nodetool cfstats command. See Cassandra documentation to get more details to use this command. Try the deployment again once Cassandra performance is back to normal. Make sure the entire Cassandra ring is normal. (Optional) Do a rolling restart on Message Processors to be sure connectivity is established. For a long term solution, review the API traffic patterns that would possibly contribute to higher reads in the Cassandra datastore. Contact Apigee Support for assistance in troubleshooting this issue. If the existing Cassandra node(s) are not adequate to handle the incoming traffic, then either increase the hardware capacity or the number of the Cassandra datastore nodes appropriately. The size of API proxy bundles are restricted to 15MB on Cassandra. If the size of the API proxy bundle is greater than 15 MB, then you will see "Error while accessing datastore" when you attempt to deploy the API proxy. Check the Message Processor logs (/opt/apigee/var/log/edge-message-processor/logs/system.log) and see if there are any errors occurred during deployment of the specific API Proxy. If you see an error similar to the one shown in the figure below, then the deployment error is because the API proxy bundle size is > 15 MB. com.netflix.astyanax.connectionpool.exceptions.TransportException: TransportException: [host=None(0.0.0.0):0, latency=159(486), attempts=3]org.apache.thrift.transport.TTransportException: Frame size (20211500) larger than max length (16384000)! Caused by: org.apache.thrift.transport.TTransportException: Frame size (20211500) larger than max length (16384000)! Deploy the API proxy and see if the error goes away. If the problem persists or you cannot move the resource files to environment or organization level for some reason, then apply solution #2. Repeat the steps #1 through #3 on all Cassandra nodes in the cluster.